Location: Huy Fong Foods Inc. Sponsorship opportunities are available. See packages for those available. The popular Chamber's networking breakfast that provides you the opportunity to highlight your business, gain new business connections and enjoy a great breakfast in a relaxed atmosphere. This is a fun, relaxed way to make business connections. Order off the menu and pay for your own meal. BBQ on the Green will be the must attend event of the year and your attendance will support the Irwindale Educational Foundation and its scholarship program! The IEF "BBQ on the Green" at MillerCoors is a major fundraising effort the Foundation undertakes, so your support is very important. 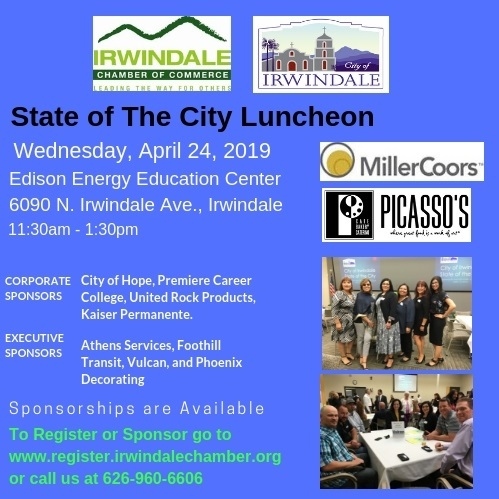 Your support of the Irwindale Educational Foundation goes directly to fund scholarships to trade schools, community colleges, and universities and is fully tax deductible as a charitable contribution. Since 2002 this event has made possible the award of scholarships amounting to over $574,000. NOTICE: The Irwindale Chamber may use photos, film, and videotape or otherwise reproduce the image and/or voice of any person who participates in any Chamber event and use the same for any purpose without payment. Your participation in any Chamber event constitutes your permission to use your likeness.